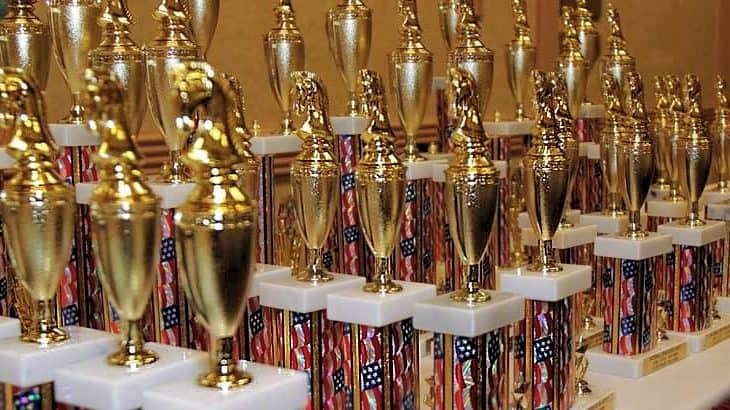 The Youth Trophy Tournament is just for fun, with a moderate entry fee and lots of trophies. It’s open to all players born after June 14, 2004. Game/25 with 5 second delay. Please bring a chess clock if you have one. The June US Chess Rating Supplement will be used. Other ratings may be used if higher or at the TD’s discretion. If you pre-register and your rating changes you will be moved up automatically or down on request. The decision of the chief tournament director regarding player eligibility, rating adjustments, unofficial ratings, or similar issues is final. There must be at least 3 players eligible for each prize that is to be awarded. Only $39 by May 23, $50 later. Rounds at 10 a.m., 11:30 a.m., 1:00 p.m., 2:15 p.m., and 3:30 p.m.
1/2 Point Byes are available in any round (limit 1) if requested before the start of round 2. Membership in the U.S. Chess Federation is required of all players. You may join with your entry or on site. Players will not be allowed to complete the tournament without a valid membership.